"Anchors Away" offers it all, whether you are looking for a romantic getaway or an action packed vacation. Located in the heart of Harbour Town Marina, you will enjoy breathtaking views of the Sea Pines Lighthouse & multi-million dollar yachts as well as enjoy numerous shops, restaurants and more. Located on the 3rd level, this beautiful villa overlooks the marina and lighthouse. Beautifully renovated, Anchors Away boasts upscale features such as wood floors, granite countertops in the kitchen, Saturnia tile in the bathroom and a new king size bed. Also, it offers a comfortable sofa which converts to a queen size sleeper bed. Within the kitchenette you will find an undercounter refrigerator, 2 burner stove, full size dishwasher and new under-cabinet mounted microwave. You can even enjoy your home cooked meal at the bar, where there is 2 bar stools. From your own private balcony, enjoy breathtaking sunsets as the sun drops behind the lighthouse. Within walking distance you can take a charter fishing trip, sailboat cruise, dolphin tour, rent jet skis, go parasailing, shop or just enjoy the live entertainment around the restaurants and bars. This unit is even across the street from the world famous Harbour Town Golf Links, one of the most distinguished PGA Tour Golf Courses (home of the Verizon Heritage). All of this for considerably less than comparable local hotels without a view! IMPORTANT NOTICES: For specific property questions, contact us using the blue "Contact Manager" button on the right side under "Property Manager" section. Please reference property name "Anchors Away". A community issued gate pass is needed to access this property. 1 gate pass is included in the quoted price. Additional gate passes can be purchased at either gate upon arrival ($22 per pass per 7 day period). The maximum number of passes permitted for this property is 2. Cancellation Policy: Requests made 120 days or more prior to arrival: full refund less the 5% reservation fee (of total rental amount) Within 120 days prior: forfeiture of the 50% deposit. Within 30 days prior: forfeiture of the total rent. Stephanie Hoke Todd Hoke Beachside Hilton Head Island Cancellation Policy: Requests made 120 days or more prior to arrival: full refund less the 5% reservation fee (of total rental amount) Within 120 days prior: forfeiture of the 50% deposit. Within 30 days prior: forfeiture of the total rent. We spent 2 nights at this beautiful property. 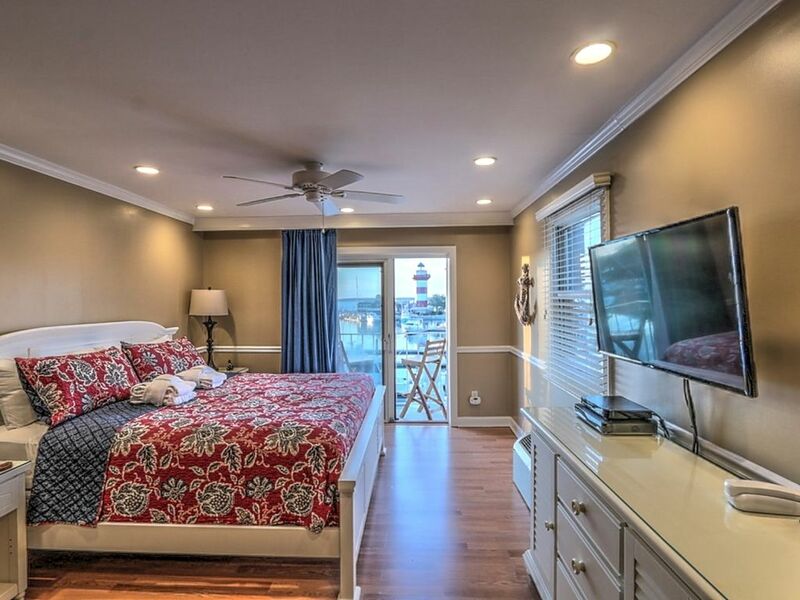 It is cozy, romantic and have a stunning view of Harbour Town Marina and lighthouse. It was super clean, most comfortable king size bed with a small balcony facing the marina. We thoroughly enjoyed our stay and was just perfect for the two of us. The booking process takes 2-3 days, but well worth it. Stephanie and Todd the property managers were friendly and very detailed in their instructions. 5 thumbs up! Clean and comfortable. What it lacks in size it makes up for in view and location. This was an ideal spot to stay in Harbour Town! The place was beyond nice and well appointed and ideally located to enjoy & explore! Ease of parking, walking, biking - it offers it all. Highly recommend this for a get-away or longer stay. Only problem was Bathroom is to small. Room was clean and I would visit again. Great Location. Staff was responsive. We loved the view! The location was wonderful... very walkable to whatever you may need! Would stay again for sure. Good place, very good quality furnishings. Ver pleasant. Nice layout for an efficiency. Great location.